Although we have read articles that highlight interview tips and highlight how to prepare for an interview, there are just some essentials that candidates somehow do not get a grasp on. This blog post recaps all the essential tips for your next interview based on our interview experience and what we see people seem to miss the most when coming in for an interview. For starters, come dressed properly. Properly means, business attire. Also, remember the less makeup and less perfume the better. Some people may be sensitive about perfumes or allergies and you don’t want them focusing on your perfume rather than your resume. Also, when coming in, if you are offered water or coffee, should you say yes? This is a big no. Coffee or water might be messy. Just keep it clean and after your interview go grab your coffee and relax! Important, bring a copy of your resume. It is essential for you to come prepared. Coming in with your clean resume and knowing about the company shows your responsible and you are always prepared. Last but not least, always always show up on time. This is a big plus. If you are late this definitely scores a negative point on your profile. No excuse. Traffic, accident, car broke down, no excuse. Be on time! Other points to never forget, keep your eyes on the person who interviews you all the time. If there is more than one person, then keep your eyes focused on the person who is talking to you at the time. Also, do not ask about salaries and benefits during your first interview, this might show you are more interested on the benefits than in your responsibilities. 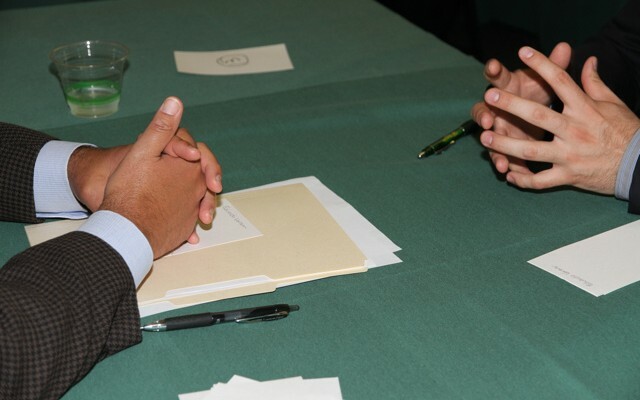 Another important factor, always have something to ask, when closing up the interview make sure to have a question. If you are interested in the position, you will always have a question. For more tips on interviews make sure to Like us on Facebook and Follow us on Linkedin or Twitter. We will always keep you posted or be sure to email us with your inquiries! P.S. Throw out the chewing gum on your way in!